Deep Green Resistance (DGR) Seattle members have some friends involved in an effort to stop a new youth jail from being built in Seattle. Instead of expanding the Prison Industrial Complex, they are calling for community programs to keep youth on a good path. The message below explains how you can help in this effort. We are at a critical point in opposing the construction of the proposed $210 million new youth jail and we need your help. On Tuesday, September 30th, the members of the Seattle City Council Planning, Land Use, and Sustainability (PLUS) committee will vote on whether or not to accept the zoning changes that King County has requested to build the proposed $210 Million new youth jail. If this project is allowed to move forward as currently planned, it will expand the prison industrial complex and racial disparities within King County’s criminal system. When you send your e-mail this Monday, September 29th, please cc us at EndingThePIC@gmail.com so that we can keep count of how many emails are sent. After you have sent your emails to the council members, forward this email to your 4 family and friends who are most likely to participate. I am writing to you today to ask you to vote NO on Council Bill 118202. I am opposed to the construction of the proposed Children and Family Justice Center. The youth of King County need a community led upstream approach and community led alternatives to detention. 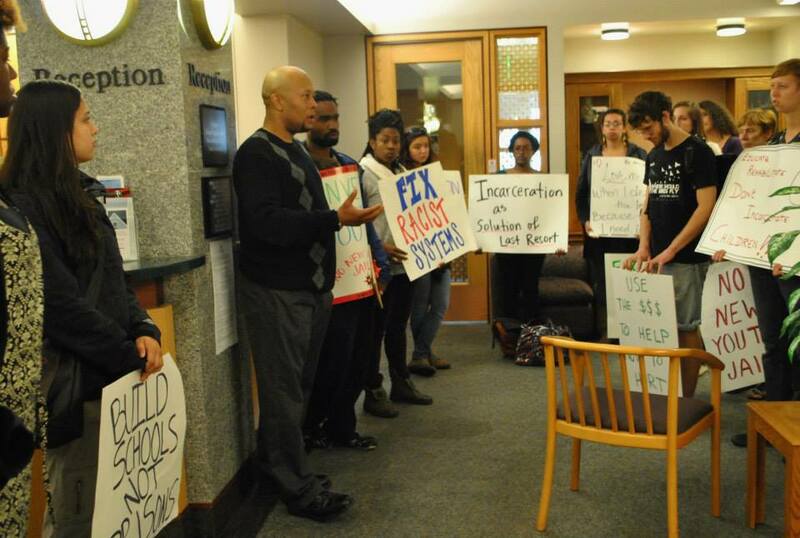 The Planning, Land Use and Sustainability Committee should not make it easier for King County to build a facility that targets youth of color, destroys lives, and does not make us safer. Please vote no on CB118202! **If you are available, please come to the City Council meeting in person. The vote will take place on Tuesday 9/30 at 2:00PM. We will meet at the city council chambers at 1:30 PM. Please wear black clothing and let the council no we will not back down! There will be a ten minute public comment period. This entry was posted in Repression at Home, White Supremacy and tagged Prison industrial complex, Seattle, Youth. Bookmark the permalink.